This Thanksgiving, heed food experts warnings. Don’t wash your uncooked turkey this Thanksgiving. In fact, don’t wash any raw meat before you eat it … ever. Not only is rinsing your turkey, poultry and other meat ineffective at killing germs, it can actually spread them, experts say. Most Americans make the mistake of washing poultry. According to the Food and Drug Administration, a whopping 68 percent of participants in a 2016 national survey said they always wash raw a whole chicken or turkey before they cook it. And that has food experts worried. 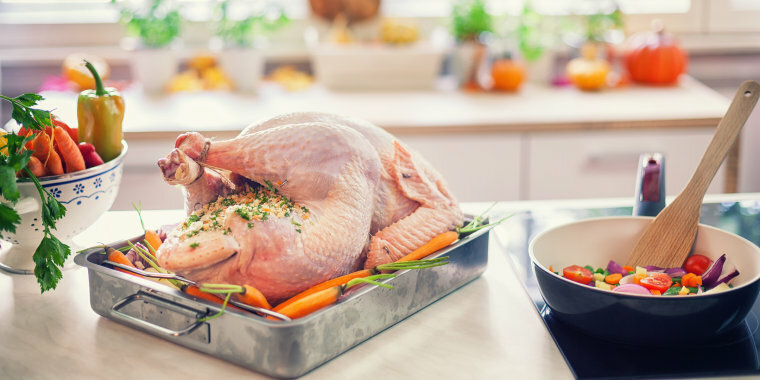 Just recently, one person died and some 164 others became sick in an outbreak of salmonella linked to raw turkey, the Centers for Disease Control and Prevention said. And on Thursday, the USDA said Jennie-O Turkey Store Sales recalled approximately 91,388 pounds of raw ground turkey products for possible salmonella contamination. While the cause of the outbreak is unclear, it shows just how dangerous salmonella, and the spread of it, can be. “You’re not making the poultry any cleaner and you’re spreading bacteria around your kitchen and probably cross-contaminating other things,” Chris Bernstein, director of food education at the U.S. Department of Agriculture, told TODAY. "(Pathogens) get on the sink, they get on your hands, they get on the faucet," he said. Bernstein and others at the USDA are beginning research into Americans' habit of washing poultry, with results expected in the spring. Previously, they found that an overwhelming number of people don’t wash their hands adequately while preparing food. “The USDA does not recommend washing poultry," says Bernstein. Even world-famous cook Ina Garten warns people not to. To help consumers understand the dangers of washing raw meat, Drexel University researchers created an animated "Germ-Vision" YouTube video showing how bacteria can ride on the misting water droplets, splattering the food-prep area in a 2-3 foot radius. "Washing doesn't sanitize," said Dr. Jennifer Quinlan, an associate professor in the Department of Nutrition Sciences at Drexel University in a 2013 interview with TODAY. On a grant from the USDA, she spearheaded the public awareness project, which has for years advised against rinsing or soaking chicken or turkey prior to cooking. Instead, said Quinlan, just unwrap the bird and stick it in the oven or on the grill or pan. The only way to kill the bacteria is to cook the poultry thoroughly until it reaches an internal temperature of 165 degrees. Health official advise following traditional procedures for avoiding cross-contamination as well. According to a survey Quinlan conducted in 2013, the most common reason why consumers chose to douse their poultry was, "that's how I was taught to do it." But Quinlan warned: "Once you introduce water, you start to give bacteria a way to move around." Do yourself, your friends and your family a favor this Thanksgiving, don't wash your raw turkey or any other meat. This updated story was originally published in 2013.